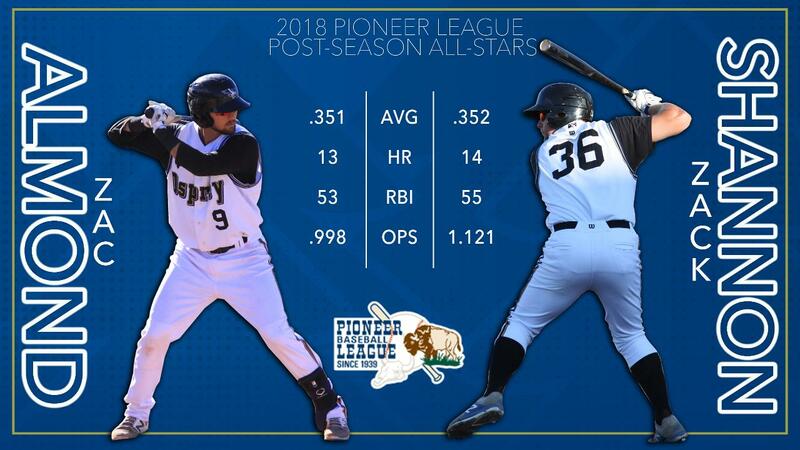 The Pioneer Baseball League announced their post season awards on Saturday and the Missoula Osprey have two players, Zachery Almond and Zack Shannon, on the post season All-Star Team. Almond was named Catcher and Shannon the League's Designated Hitter. The Post Season All-Star Team is quite the honor as it rewards the top player in the Pioneer League at each position. Almond and Shannon, known in Missoula as the Zac(k) Attack, have had impressive numbers and dot most of the Pioneer League league leading hitting categories. Entering play tonight, they are 2nd (Shannon .352) and 3 rd (Almond .351) in batting average, 1st (Shannon 14) and 2nd (Almond 13) in homeruns, 1st (Shannon .687) and 3rd (Almond .608) in slugging percentage, and Shannon is tied for 3rd in RBI with 55. Almond is right behind him with 53. The Pioneer League Player of the Year was Grand Junction 2B Coco Montes and the Pitcher of the Year was Idaho Falls pitcher J.C. Cloney. The Osprey are in Helena for a 3-game series through the Labor Day weekend. Game time on Saturday night is 7:05pm. Fans can listen to the game on ESPN Missoula 102.9 FM. The Osprey return home for the final homestand of the season next week versus Helena Tuesday through Thursday. Tickets are on sale now at the MSO Hub in downtown Missoula or by visiting the Osprey at www.missoulaosprey.com.